Briefer than Literal Statement: Upminster, Tower of London, Stratford, Brixton, and home. Upminster, Tower of London, Stratford, Brixton, and home. My brother and I continued our forays out into the wild ends of the tube network last week by going to Upminster. 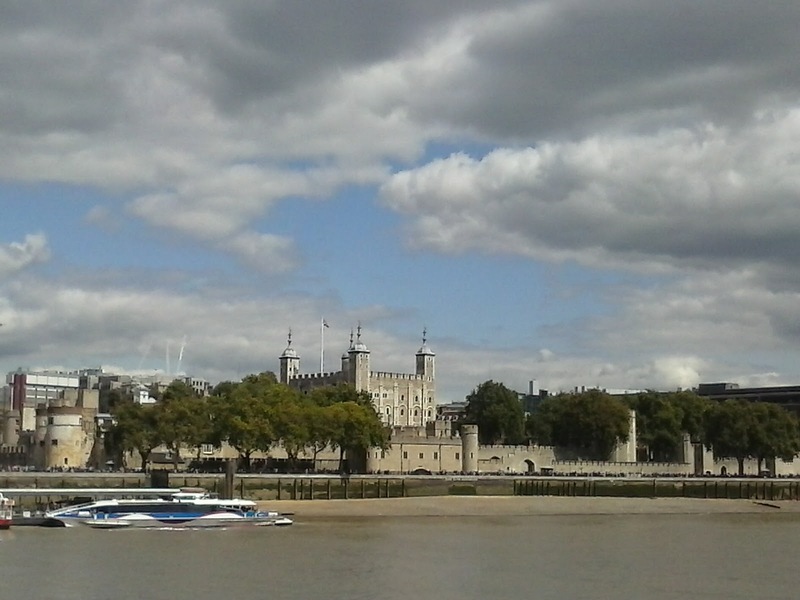 It took a while - all the length of the district line from Wimbledon to Upminster, with a short break to look at the Tower of London and use the toilets there. It's curious, but each time I see the Tower it seems smaller. I think it's because it looks as though it's built of grey brick, and somewhere between the eye and the brain those bricks get shrunk to normal brick size, instead of the great heavy lumps of stone they truly are. This means that when you go in - which I did as recently as August before it stopped being free to Art Fund members - there's a Tardis effect. I like walking round the walls of castles, even in late August drizzle, but the rooms themselves I think I remembered too well from before, and there's an issue with tourist sites anyway. You meet the same historical characters: Henry VIII, Samuel Pepys, Elizabeth I, and get the most superficial understanding both of them and of their age. It gets wearing. The crown jewels don't look real, but that's just because the idea of diamonds that size seems so absurd. The lead up to them and the conveyor you ride on is all very well done. I'm lingering on my descriptions about the Tower because there isn't much to say about Upminster. The name gave me hopes of some old ruined Cathedral or college but it was really just a high street. Not that I'm complaining. Upminster doesn't try to pull in tourists and is so far from the centre it's almost not in Greater London at all. Really what I think of as boringness is just self-sufficiency. There's an old-fashioned department store - Roomes - with one half of the premises on one side of the street selling clothes and the part that does furniture on the other side. Judging from the trade when I was there the make-up counters are keeping the whole thing in the black. Other than that the usual chains of coffee shops and a quick train to Stratford. I haven't been to Stratford since the Olympics. Just before all the building started I walked through up the canal and the River Lea (the Limehouse Cut connects my old friend the Regents Canal to the Lea) and a little bit after that Dad put up some restaurant ceilings in the vast new shopping centre there, but the coincidence isn't that great. It seems to have been one of those projects that every second builder in London got pulled in on. It's another Westfield. Not as claustrophobic and disorientating as I find the Shepherd's Bush one, not trying too hard to sock you over the head with sheer abundance, and easier to leave. Easier to navigate - we found the Olympic Park at once. Gorgeous wild flower planting, flats going up by the international train station, kids running through those pavement fountains, and the vast stadium of course. We walked about for a bit - meeting other walkers and cyclists - then headed up the canal to the lock. This of course is the rougher part, a bit like Camden used to be. Good graffiti, small businesses and warehouses, a distinct smell of cannabis at one point. It felt like somewhere different. If I'm honest, somewhere less contrived, and we had the familiar discussion about gentrification and how local councils need to strike a balance between improving a place and not losing what they've got. From Homerton then to Brixton. I have been to Brixton recently - walking through towards London and also on the bus - but my brother hasn't and it used to be one of his favourite haunts. He was checking out what clubs are still there. Then Wimbledon, Sunday lunch at Wetherspoons, and home.